Take a guided walking tour in New York City and taste pizza at three of Manhattan’s top pizzerias along the way! 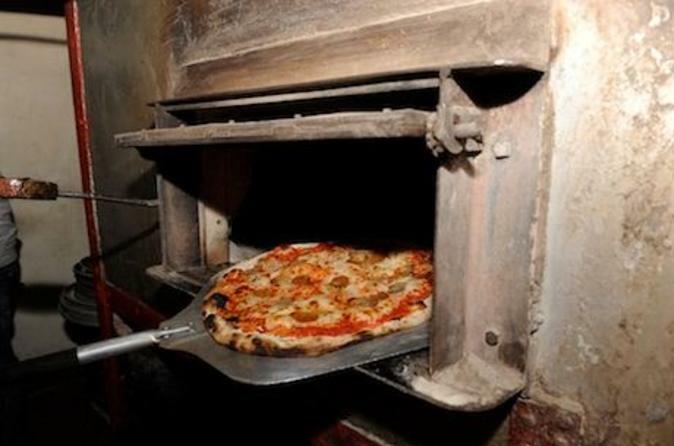 Sample the pizzas of Little Italy and lower Manhattan on the Crosstown Pizza Tour. Or head to Greenwich Village to see what tasty pies they offer on the North Village or South Village Pizza Tour. Or opt for the Lower East Side Pizza Tour for a delicious journey through the eclectic neighborhood. Spend time with the owners of each pizzeria that you visit. Learn about the different types of pizza that each venue makes, hear how pizza has changed over the years and enjoy a slice at each to determine your favorite! New York City is a hub for fantastic pizza, so how to choose where to go? On a pizza walking tour, of course! Enjoy slices of pizza from three local pizzerias and learn a little history while you walk through historical Manhattan neighborhoods such as Little Italy, Greenwich Village and the Lower East Side. Your pizza enthusiast guide has the insider information on where to go and what to order, so relax and enjoy an afternoon in New York! Receive a pocket pizza journal as well! Visit Manhattan’s famous Little Italy, which the majority of Italian immigrants called home in the early 1900s. See the streets that once overflowed with peddlers and fruit carts and where a peasants’ meal called ‘pizza’ made its debut in America. Visit America’s oldest pizzeria, and admire the sights of these two lovely neighborhoods as you walk. Discover the evolution of pizza from its humble origins in Southern Italy to its cheesy transformation in America’s industrial cities. This Manhattan district was once a thriving Little Italy and is currently in the middle of a resurgence, with new shops being opened by recent Italian immigrants. Visit pizzerias that each specialize in a different type of pizza – types that symbolize its development from a lowly Neapolitan street food to a celebrated American staple. If you love pizza, welcome to one of the most pizza-dense neighborhoods, the Lower East Side. Everything from classic pizza-by-the-slice, old-fashioned Neapolitan fare to creative spins on this eponymous dish, this neighborhood has it all. Taste and discover its rich history. Learn about ancient pizza toppings and dough stretching techniques and compare the baking patterns of three different pizza ovens. This tour is for true pizza aficionados.